The FIFA Task Force mechanism, an attempt by FIFA to ease the suffering of Palestinian football, was started after the FIFA 63rd Congress in Mauritius in June 2013, when the congress voted to give FIFA President Mr. Joseph Blatter a mandate to address the complaints raised by the Palestine Football Association regarding its inability to develop the game of football because of the Israeli occupation . It was reviewed in the following FIFA Congress in Sao Paulo, in June 2014.The FIFA congress had heard the report of FIFA President Sepp Blatter on the mechanism (involving both the Palestine and Israel Associations), and had unanimously voted in a proposal by the President to develop the mechanism and try to fix its many shortcomings. A neutral monitor was appointed after the FIFA 64th Congress with a mission to oversee the proceedings of communication between the parties involved, and make sure FIFA intervenes to address any issues that may arise. The monitor presented both his report and resignation to the FIFA Executive committee in December 2014, and the Task Force reached a dead end. So, Why did the Mechanism not produce any viable change? The absence of a stance by the IFA against its government’s policy to hinder the development of Palestinian football, which makes it extremely difficult for the PFA to benefit from the rights and carry on the obligations stipulated in articles 12-1/d-e, 13-b and 13-e of the FIFA statutes. 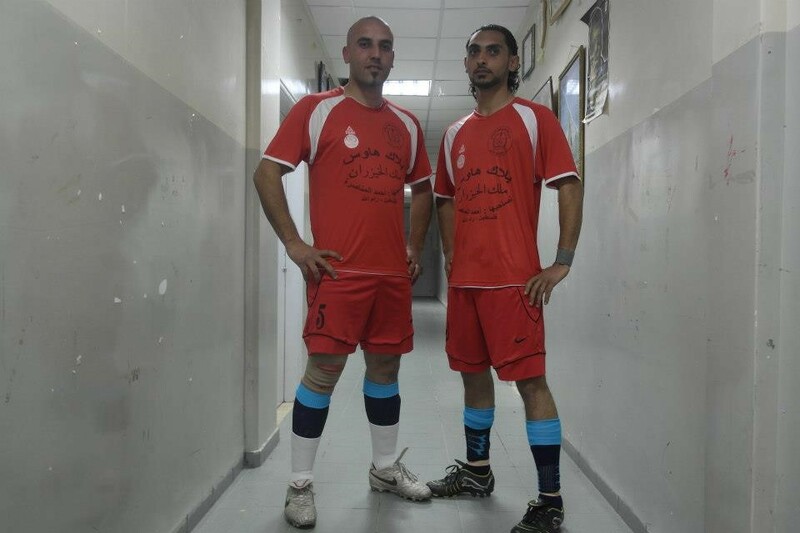 including allowing clubs in illegal Israeli colonies located in internationally recognized Palestinian territories (as per UN Security Council resolutions (S/RES/242) and (S/RES/338), and UN General Assembly resolution (A/RES/67/19) to play, and be registered, in the Israel FA league, which constitutes a violation of articles 10-1, 13-1/i and 17-1 of the FIFA statutes. “Beitar Jerusalem FC” which is an Israeli professional football club from Jerusalem, and a member of the Israeli Premier League, continues to embrace racism, unchecked. Eli Cohen, The manager of the club, had told Israel’s Ynet that “There’s a difference, and it makes a difference, between a European Muslim and an Arab Muslim and the fans here have a problem with Arabs living in the Middle East.” The racism of said club was reported by an ESPN documentary; yet, no serious measures were taken against the club. Only in Israeli soccer can a club block Arabs from joining its ranks, and harsh violence is treated solely as a disciplinary infraction, to be handled by the Israel Football Association’s internal court. 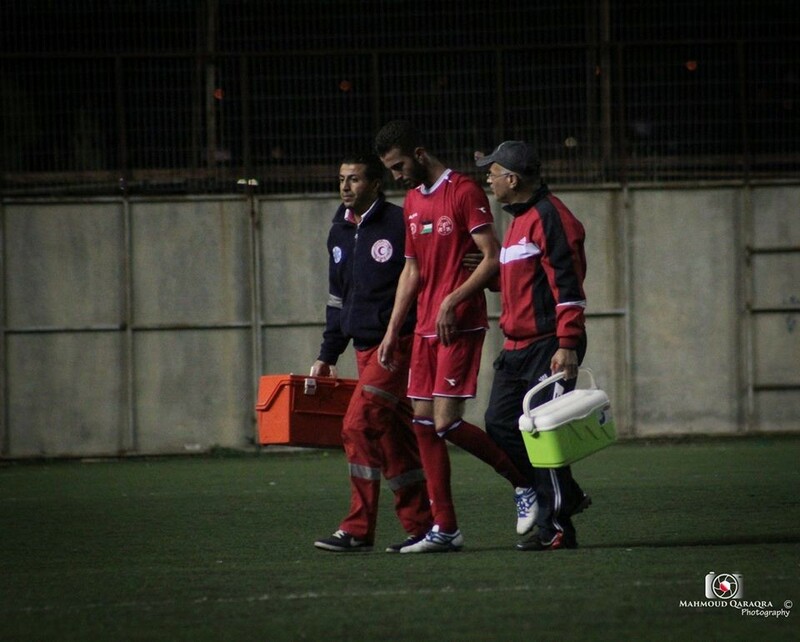 Limitations of movement for players within the West Bank. 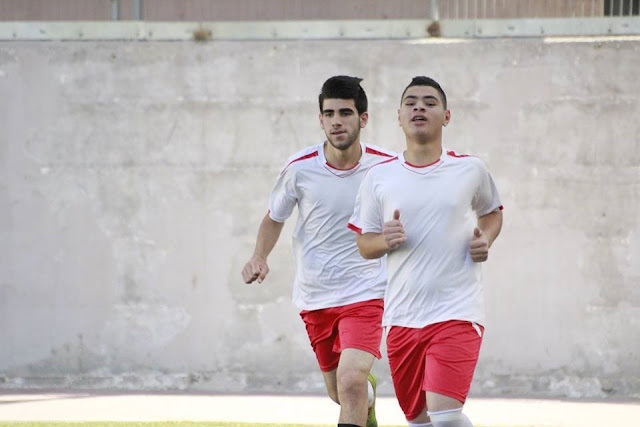 Impossibility for the PFA clubs established in East-Jerusalem, notably two of the Palestinian Premier League clubs, to develop their activities and play at home. Limitations of movement for PFA officials (for ex. Executive Committee members) and players between the Gaza Strip and the West Bank, in particular for the players selected for the Palestinian national team who cannot join training camps, play in their clubs in the Palestinian Premier League and face arrest upon returning from international football competitions. Issuance of permits for foreign delegations based on arbitrary decisions (for ex. permits issued excluding some players or the coach of a team without any explanation, permits issued only on the day of the competition, permits refused for referees and match delegates, etc…). Humiliating treatment at the border by the relevant Israeli authorities to both Palestinian players/officials and foreign delegations, including FIFA, AFC, and EUFA officials (for ex. delayed authorization to cross even when the permits have been issued, aggressive and harassing questioning, etc…). Violent acts by Israeli security forces during football matches (for ex. stoppage of matches, training sessions, arrests) and/or closure of clubs without explanation including in areas under the authority of the Palestinian National Authority. Israeli Football Association (IFA) was organizing football activities on the territory of the PFA. Once the knowledge of PFA's proposal became public, the Israeli government formed its own "internal" task force to countermand the proposal, and bring it to an end, putting into use its arsenal of political influence and employing its diplomatic channels; President's of influential associations and confederations were visited by Israeli diplomats trying, on one hand, to convince them the proposal was a "political issue that should not be handled by the global football governing body", and waving the "anti-semitism" threat when the first option failed. 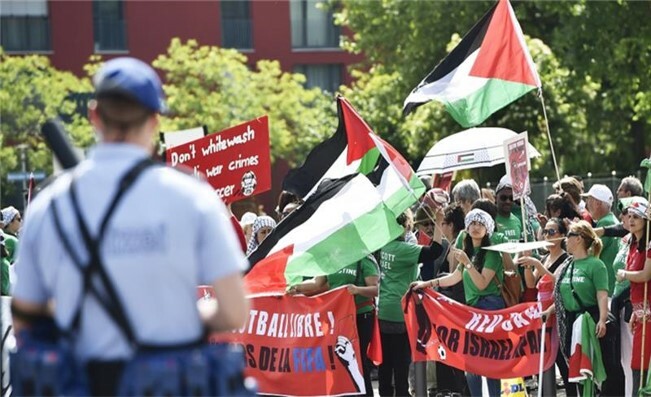 There were, however those public opinion groups and human rights activists who refused to buy into the Israeli claims and were actively campaigning not only to suspend IFA, but to kick Israel out of football, as had been the case with Apartheid South Africa. Even two days before the congress, the atmosphere was almost toxic. FIFA's President Blatter already had a huge internal problem to face beside the tens of Israeli government officials who had infiltrated the grounds of the congress and were lobbying the delegates; or the hundreds of human rights activists who were besieging the grounds of the Congress demanding that Israel faces justice. Blatter had the Presidential elections to worry about, and so did those who wanted him saved and those who wanted to witness his demise. The wheel of Fortuna was moving out of proportion; none of the football world tycoons seemed to take interest in the plight of the Palestinians as Fortuna was threatening to toss all up, down and about. The Palestinians had to quickly devise a plan "b' to safeguard their rights, and keep the "big guys" interested in finding a solution to the problems. Following advice from the Presidents of all the Confederations, and other football prominent figures, the PFA proposal was amended where suspension was "suspended" from the proposal, in return for a promise that the Congress be asked to vote on the amendment that demands a neutral committee be formed by the Congress to handle all three grievances presented in the original proposal, and that proper disciplinary measures be taken within a specific time-frame against the party that does not comply. Despite all the attempts to "ditch" the issue, The 65th Congress agreed, by an overwhelming majority as set out in its approved minutes, and with the agreement of the IFA, that the "FIFA Monitoring Committee Palestine-Israel", chaired by Tokyo Sexwale, be mandated by the FIFA 65th Congress to cover the three issues, but “would not handle political or territorial matters” pending an answer on “the issue of territory” which “should be decided by the United Nations”. Several meeting were held, much legal paperwork exchanged, and a lot of time wasted while the IFA procrastinated in an attempt to obscure the directives of the committee and downplay its mandate. It was the right time for ambiguity; FIFA and the world of football were all busy with the FBI crackdown on FIFA officials. Football tycoons had more up-close and personal problems in their laps than could fit the added problems of the Palestinians. They had voted in a committee, and this committee had one long year to sort things out until they re-formed their alliances. 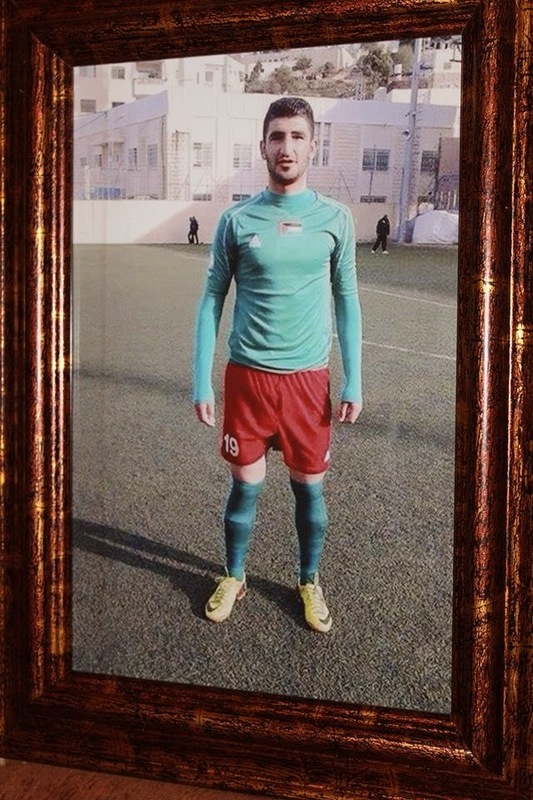 On Wednesday, January 15, 2015 at 3:30 a.m, an Israeli occupation force arrested Mu'ayad Walid Ibrahim Tumar, 22 years old, holder of ID# ‎(520314139), and a football player of Beit Ummar Football Club.‎ The Israeli force raided Mu'ayad's house in Beit Ummar village, south of Palestine, and arrested him under the pretext of throwing stones and Molotov cocktails at Israeli occupation troops. ‎Mu'ayad is still imprisoned pending trial. 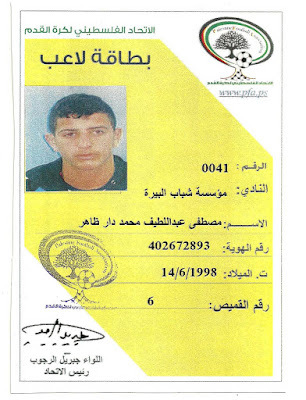 On Wednesday 11 February, 2015 at 2:30 a.m, an Israeli occupation army force arrested Muhammad Ayman Muhammad Ikhleil, 21 years old, holder of ID# (854181260), and a football player registered in Beit Ummar Football club. 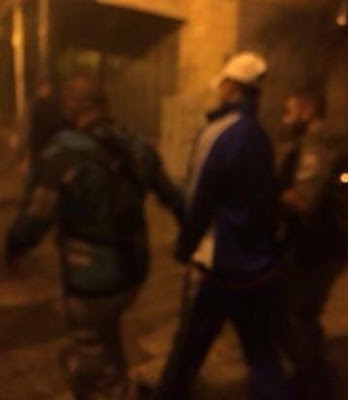 The Israeli occupation forces surrounded Ikhliel's house in Beit Ummar village, south of Palestine , and arrested him for a consecutive third time under the pretext of throwing stones and Molotov cocktails at Israeli occupation troops. 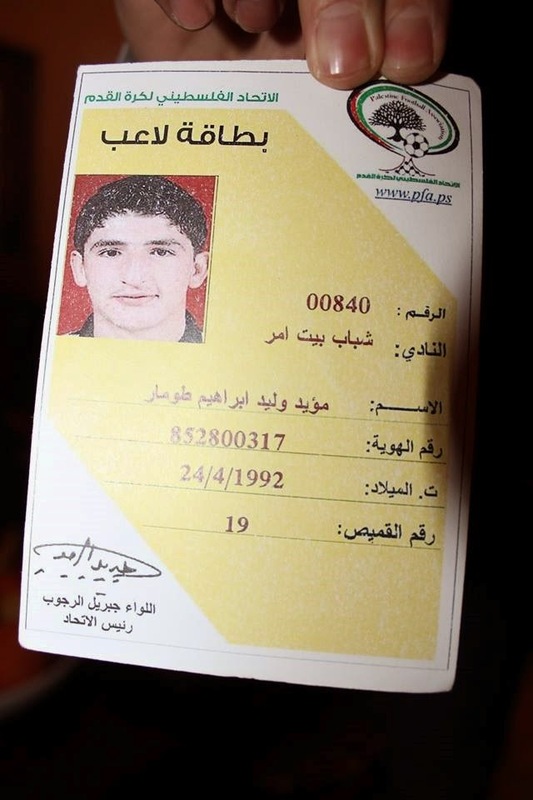 Ikhleil was arrested for the first time on the 7th of August, 2011 and sentenced to one- month and 14 days jail time. He was released on September 21, 2011 before he was arrested again on September 10, 2012 and sentenced to eight-month jail time under the same previous pretext. 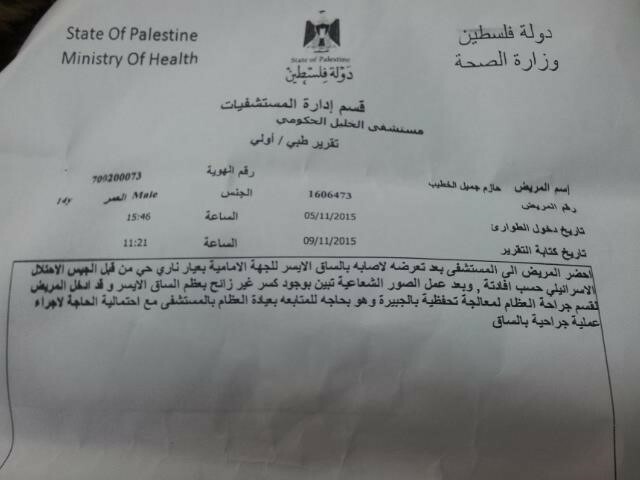 He has been charged of a total fines of NIS 6000 ($1500). On Tuesday, 28 April, 2015 at 3:15 am, an Israeli Armed Force arrested player Muhammad Abed AL Fatah Arar, 18 years old, holder of ID# (854181260), and a football player of Beit Ummar Football club (juniors). The Israeli force surrounded Muhanad’s house in Bani N’eim, a village, east of Hebron, and arrested him under the pretext of throwing stones at Israeli occupation troops. Muhanad is still in prison pending trial. He was taken to Etzion encampment -south of Bethlehem. On Monday, May 11th 2015 An Israeli occupation armed force shot AL-Amari youth club fencer Rafet Abu Lebdah, 17 years old and holding ID No. (404113698). 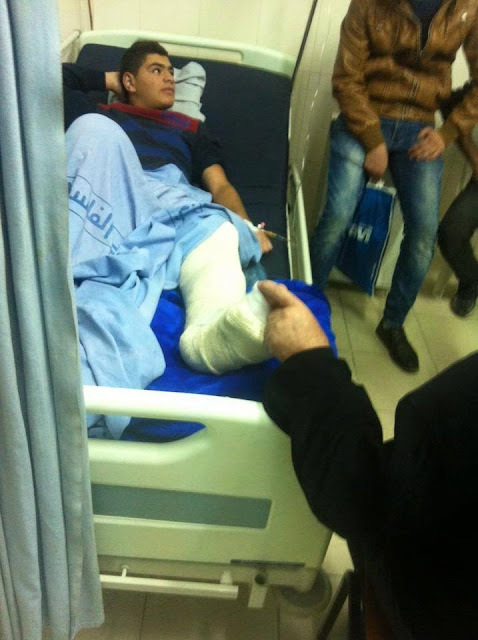 Eye witnesses confirmed that there were no clashes in the area when Rafat was shot in his left leg. 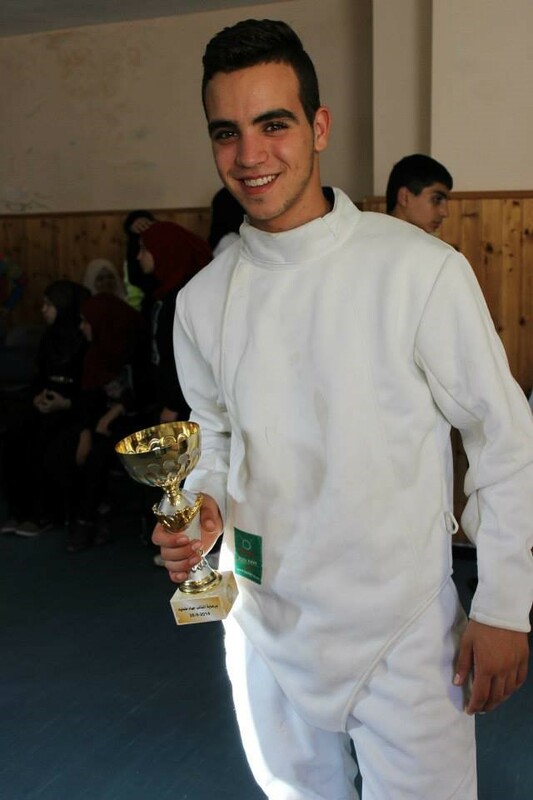 The fencer himself swore that he was on his way from school to pick up his cousins when he was shot. 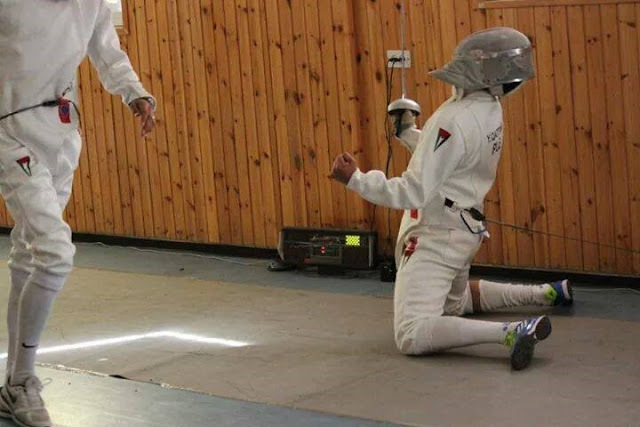 The injury left him unable to fence, or even walk, for a long time. 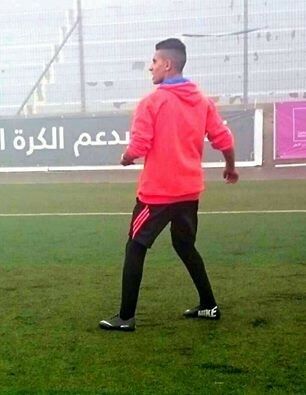 On 21 May 2015, just as the solution (suggested by the Israeli goverment to Mr. Blatter) to give VIP treatment for Palestinian players was being put on the scale, the Israeli occupation tipped said scales by detaining player Sameh Maraaba for three hours on the border with Jordan. 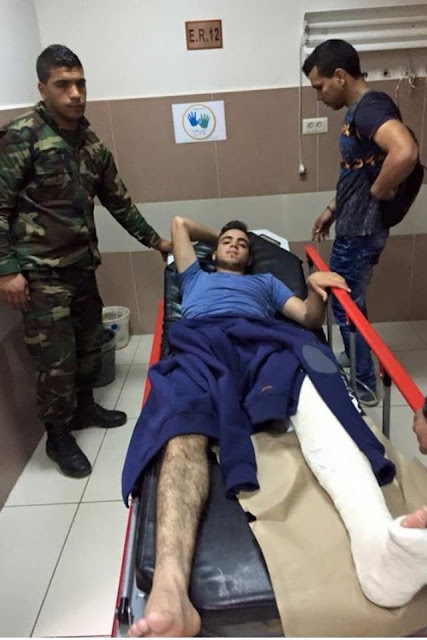 Maraaba was heading for Tunisia with the national team when this incident happened. 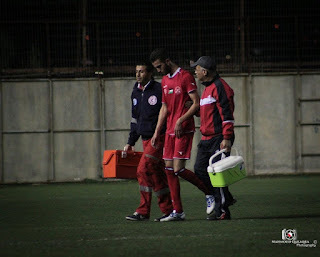 Team members said that only by the team's refusal to leave without their player that Maraaba was finally allowed to travel. 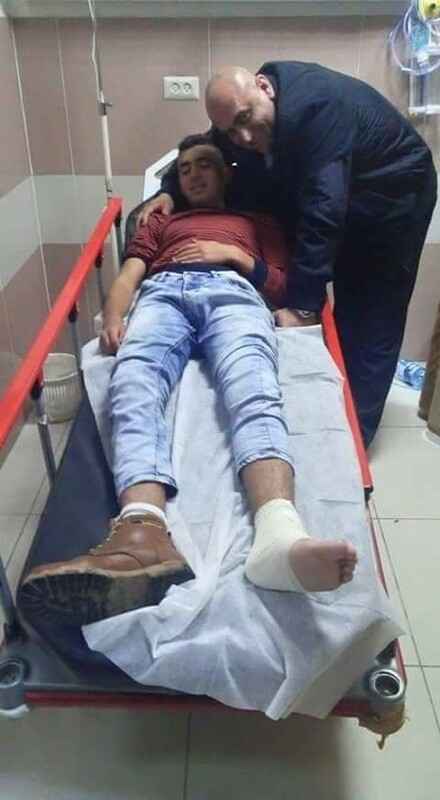 On Friday September 4 ,2015 at around 9:00 p.m., A group of Israelis settlers (estimated at 5 people, according to eye witnesses), attacked referees Abdel Noor Mohammed Abdel Jabber Khaled, 52 years old, citizen of Jayyous, and holder of ID #(997405352); and Rashid Ismail Mahmoud Radwan, 49 years old, citizen of Azzun, and holder of ID #(964390058). 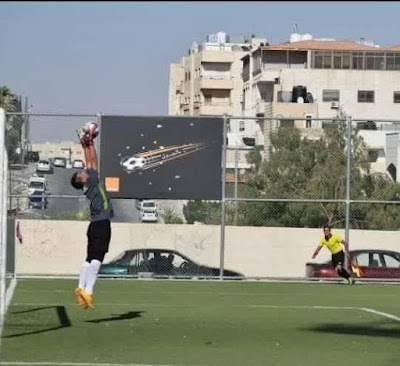 The attack took place near the settlement of “Carneh Shomron”, near the city of Tulkarm, while both referees were driving back from a 1st division match in which they had officiated in Al- Fara’a. On 8 October 2015, the Palestinian Olympic team was heading back to Palestine from Qatar after participating in the WAFF Qualifiers, via Al-Karamah crossing (King Hussein bridge). 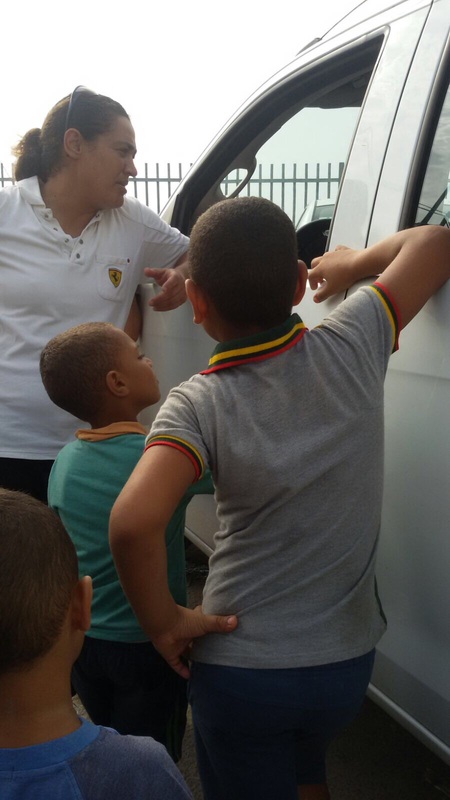 At around 19h30 the team (24 players and 8 Officials) arrived at the border. 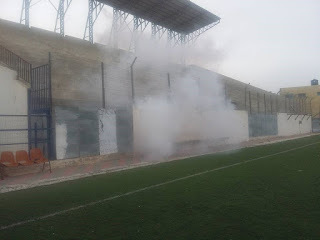 Procedures took about an hour and the team checked out safe for the team striker Mahmoud Wadi, a resident of Gaza, who was asked,at around 20h30, to sit aside. Islam Abu Mukaddam, the team Manager, remained in the hall waiting for the player while the rest of the team cleared customs and waited outside. The Civil Ministry and DCO were informed but nothing happened. The team waited until 23h00, when Islam asked them to leave and said he will wait with the Mahmoud. 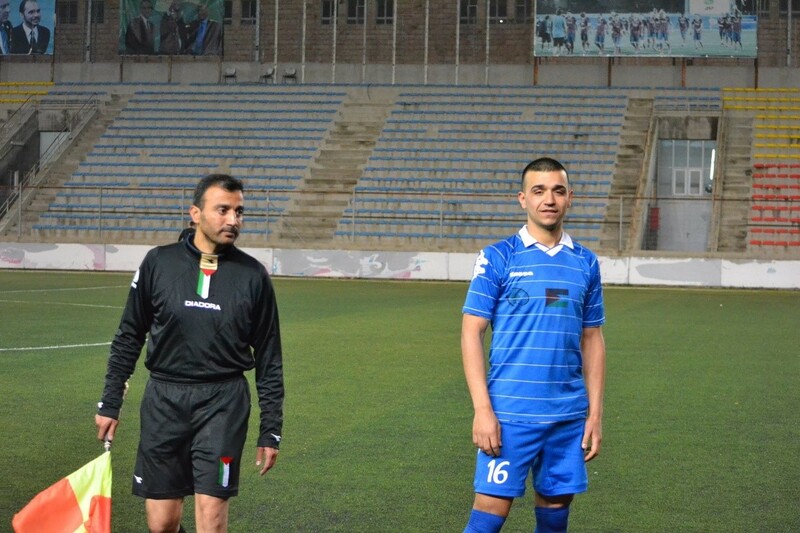 Having been sitting so long waiting with the player, Islam was approached by armed security personnel in civilian clothes, (there were 5 of them around). One of them, a tall man wearing a sport shirt and jeans, told him he has to leave the hall and check out customs, and that he cannot wait inside. Islam tried to tell him he is waiting with his player who does not know whether he will be allowed to enter and not, and that -as manager of the team- he cannot leave without being certain of the well being of his player or whether he needed anything. The tall security guy was shouting and did not want to listen while Islam was asking him to just listen to him. He slapped him across the face then the other 4 came. The tall guy shoved him, and the group sent his bag through the scan machine and to the customs hall. One bald guy wearing a golden chain around his neck came about. Islam says this guy looked as the one in charge so he tried to talk with him to no avail. Islam just wanted to give his player phone numbers and some money in case he was returned to Jordan. At around 11:20 an army officer approached Islam, as the writer of this blog was speaking with him on the phone, and asked him what happened, and he reported what he has told the writer minutes before. He was then informed that Mahmoud Wadi was denied entry and that he had to go back to Jordan. 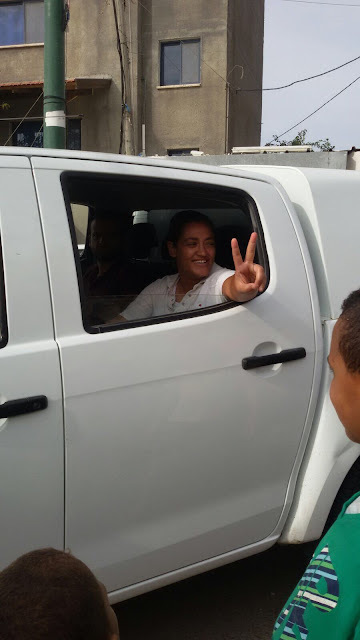 On 13 October, 2015 , former Palestine National Women's Team player Hamama Jamil Jorban was arrested by the Israeli authorities in her hometown of Jesr Al-Zarqa. She was interrogated about some facebook posts she made protesting racism and Israeli atrocities in Al-Aqsa. She was released later on the same day. 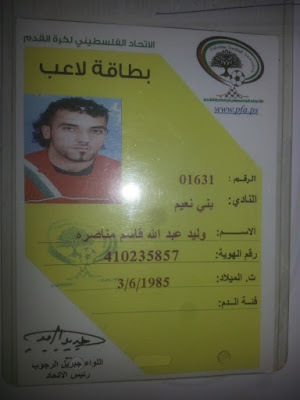 On Tuesday, October 27, 2015, at around 5:00 a.m., a joint Israeli Force of Border Guards and Israeli Intelligence (estimated at 30 military vehicles according to eye witnesses) arrested player Abdullah Nabil Noah Da`ana, 23 years old and holder of ID#(204715031). 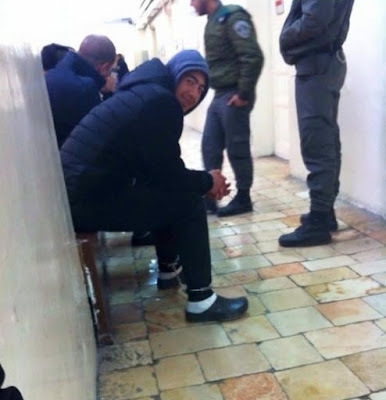 The Force surrounded Abdullah’s house and arrested him under the pretext of “throwing stones at Israeli soldiers". The force took Abdullah to the detention center of Al-Masqubiyah (Russian Compound), where he was charged with the above accusation and sentenced to home detention for 5 days and the payment of a 1000 NIS (250 USD) fine. 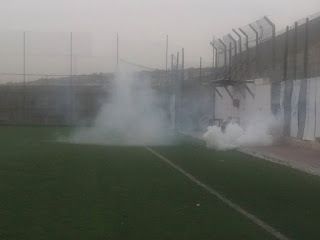 On Tuesday, November 10, 2015, at around 1:30 p.m., an Israeli armed force (estimated by eye witnesses at 20 military vehicles and 150-200 soldiers) arrested the sport supervisor, and Board Member of Islami Qalqiliya Sports Club, Adnan Abdel Nasser Arafat Rabbi, 45 years old, and holder of ID #(946857653). 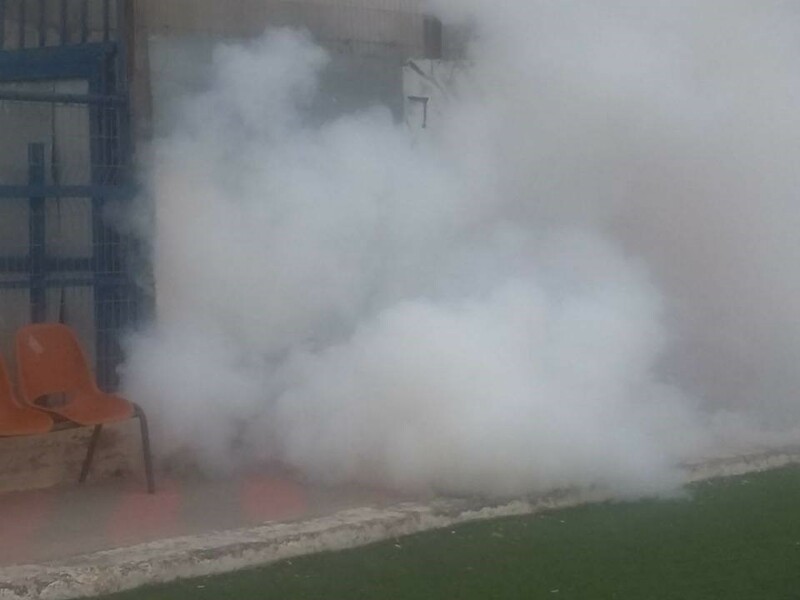 The force took Adnan from his house in Kfar Saba (inside Israel and close to the Palestinian city of Qalqiliya), after blasting the doors, and messing up the contents of the house. On Sunday, November 12, 2015, at around 14.30, Israeli Army Forces fired tear gaz canisters in the premises of Al-Khadr Stadium, near the city of Bethlehem, during a match between Al-Bireh FC and Jabal Al-Mukabber FC, in the final round of the Semi-Professional League. 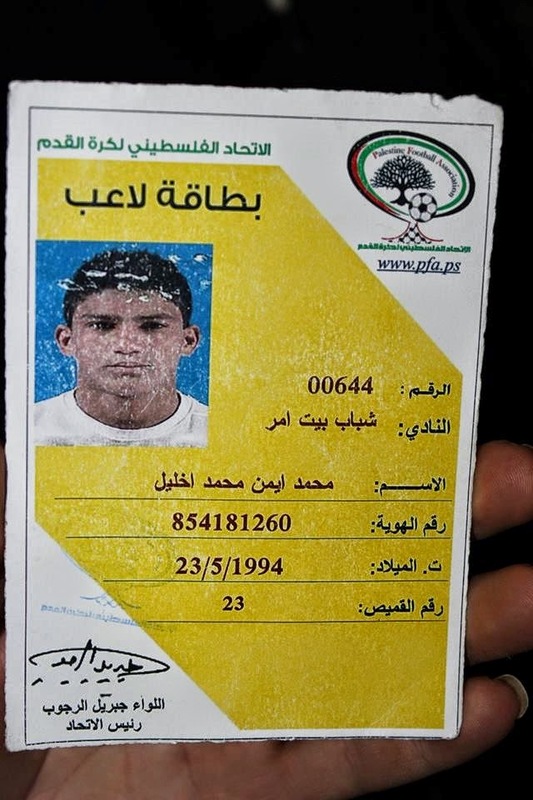 On Thursday, November 19, 2015, at around 2:00 p.m., A joint Israeli army and intelligence force, (estimated at 6 military jeeps and 30 soldiers) arrested player Hussam Imad Theeb Qarakrah, 16 years old, and holder of ID No.# (405001157) . 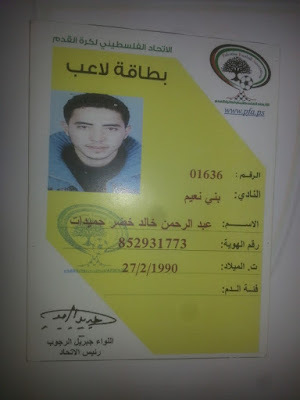 The force arrested Hussam from his house in Al-Balou’ neighborhood, in Al-Bireh. The Palestine FA submitted a permit request (Southern Governorates to Northern Governorates) for Mr. Ibrahim Abu Salim (PFA Vice President) on December 7, 2015. The Isareali DCO answer was an OK with the condition that Mr. Abu Salim go through an interrogation at the Erez Checkpoint on the date of his entry (12/9/2015 at 9h00 a.m). Mr. Abu Salim waited at the Erez checkpoint from 9h00 until 11h00 a.m, only to be informed that he is being turned back to Gaza and denied entry, without any explanation. It maybe worth mentioning that Mr. Abu Salim has been moving between Gaza and the West Bank without issues until this incident. An article on my blog about the struggle against the occupation of Palestine which mentions your blog as well - please share and distribute. Your failure to publish it is recorded.